Shortly after Morgan Stanley beat across the board, reporting a fixed income number that bucked the trend observed by most other banks and surprised to the upside, Goldman once again failed to keep up with its increasingly more powerful competitor, and despite reporting a strong overall quarter with revenue of $8.65BN beating estimates of $8.37BN, and EPS of $6.28, also higher than consensus of $5.38, the central bank incubator once again disappointed in its core FICC group, as fixed income trading of $1.31BN, down 10% Y/Y, and missing expectations of $1.45BN. 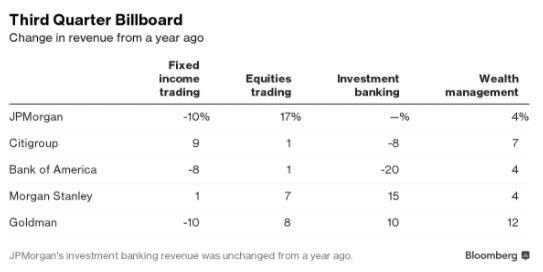 As shown in the Bloomberg chart below, Goldman joined BofA and JPM in reporting a decline in FICC revenue, even as it posted improvements across all other major product lines. Commenting on this decline, Goldman blamed the "significantly lower net revenues in interest rate products and lower net revenues in credit products and mortgages" which were "partially offset by higher net revenues in commodities and currencies." Goldman also noted that during the quarter, "FICC Client Execution operated in an environment characterized by low client activity amid low levels of volatility." And while Equity sales and trading was stronger than expected, printing at $1.79BN, up 7.6% Y/Y, and above the $1.73BN expected, total trading revenue of $3.1BN came in just below expectations of $3.12BN. The increase in revenue was due to higher net revenues in equities client execution, "reflecting significantly higher net revenues in derivatives, partially offset by lower net revenues in cash products." 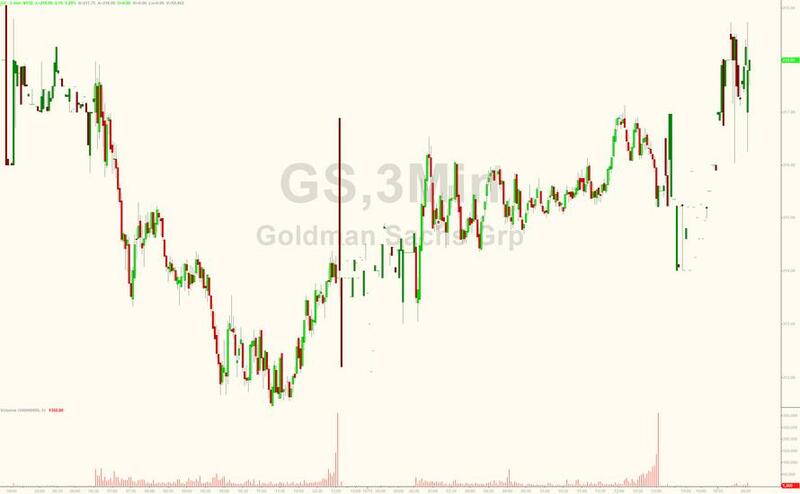 Commenting on the state of the market, Goldman said that during the quarter, "equities operated in an environment generally characterized by continued low levels of volatility and lower client activity compared with the second quarter of 2018." Finally, the group that once was Goldman's golden goose, prop trading or as it is now known, Investment and Lending, and which now houses Goldman's consumer lending arm Marcus, generated net revenues of $1.86 billion, above the $1.8BN expected but down 1.2% Y/Y and 4% lower than the second quarter of 2018. 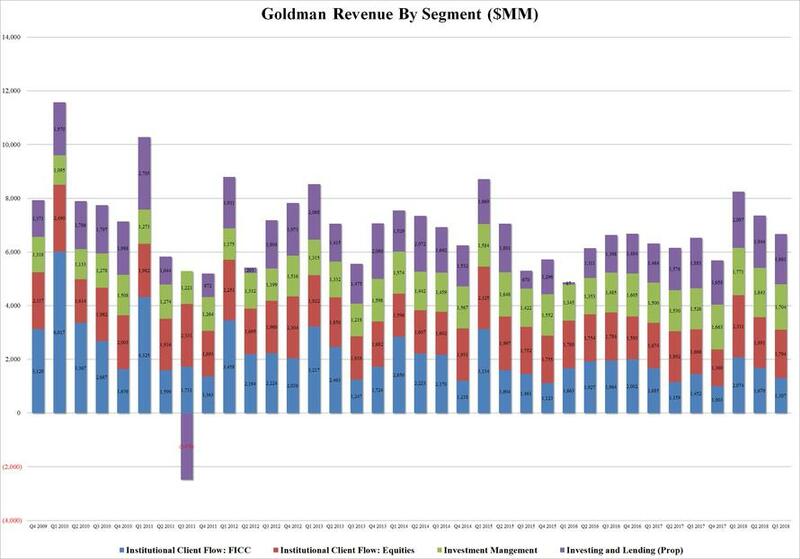 What was most notable here is that net revenues in equity securities - in which Goldman traded as prop - were $1.11 billion, 20% lower than the third quarter of 2017, due to significantly lower results from investments in public equities. Some more details on Investing and Lending: Goldman revealed that net revenues in debt securities and loans were $750 million, 52% higher than the third quarter of 2017, primarily driven by significantly higher net interest income. The third quarter of 2018 included net interest income of approximately $700 million compared with approximately $450 million in the third quarter of 2017. Curiously, Goldman also revealed for the first time its provision for losses on loans and lending commitments for the third quarter of 2018 was $174 million compared with $64 million for the third quarter of 2017. Commenting on the earnings, new CEO David Solomon bragged that "Year-to-date earnings per share is the highest in our history and year-to-date return on equity is the highest in nine years, notwithstanding our continued investment in growth opportunities. We remain well positioned to continue delivering for our clients and shareholders." Solomon will also be happy that Goldman's effective income tax rate for the first nine months of 2018 decreased to 19.0% from 19.4% for the first half of 2018, reflecting the impact of permanent tax benefits and changes. Looking at the expense side, expenses rose less than analysts expected, climbing 4% to $5.57 billion. The bank says the increase is primarily due to non-compensation benefits (Goldman's compensation costs usually decline in the back half of the year) which increased 14% to $2.48BN, due to an increase in provisions for litigation and regulatory proceedings. And speaking of comp benefits, Goldman announced that headcount increased by 1,800 employees - the most since Q3 of 2015 - to 39,800. The bank also reported accrued comp benefits of $3.1 billion resulting in a compensation margin of 35.8%, down from 36.9% last quarter, and resulting in the lowest implied average compensation per banker since Q2 2016. Finally, going back to the beginning, it is worth noting again what David Solomon said at the top, namely that in his first quarter as CEO, YTD EPS of $19.21 for the 150 year old Goldman "is the highest in our history." Helping this was Goldman's repurchase of 5.3mm shares for $1.24 billion. And so, in light of the overall strong earnings, if disappointing FICC result, Goldman shares are up about 1% after market, failing to rally as much as Morgan Stanley which continues to rise in the premarket.